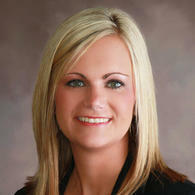 I began my career with Missouri Farm Bureau Insurance in June 2007. Prior to working for Farm Bureau, I attended college at Missouri State University where I graduated with a Bachelor of Science degree in Insurance and Risk Management. While working for the company, I continued my education earning the Life Underwriting Training Council, LUTCF, and Financial Service Certified Professional, FSCP®, designations. I have received many awards and recognitions with the company. I am a member of the National Association of Insurance and Financial Advisors (NAIFA), Jefferson City Area Chamber of Commerce Young Professional group (HYPE), Jefferson City Ambassadors and the Special Learning Center Foundation; serving on the board for each organization. My husband, daughters Presley, Harper, Kinzley and I are members of St. Peter's Catholic Church in Jefferson City. I am committed and take pleasure in having the opportunity to work with my clients on a daily basis to meet all their insurance needs.